What's that? 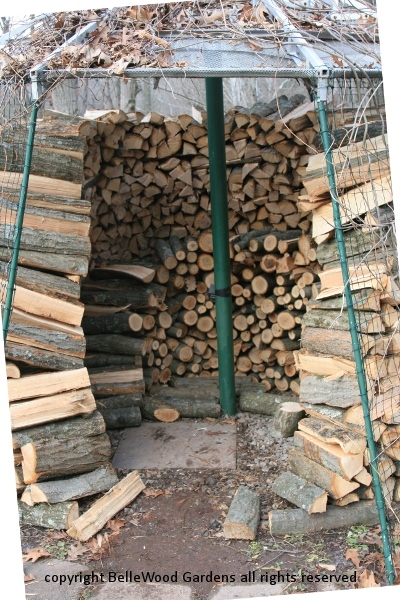 It's a charming way to efficiently stack firewood on a modest footprint. 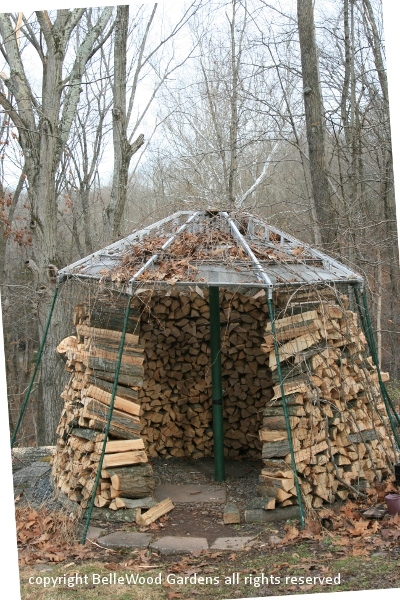 Here's how it came about that we discovered this attractive method of piling up firewood. 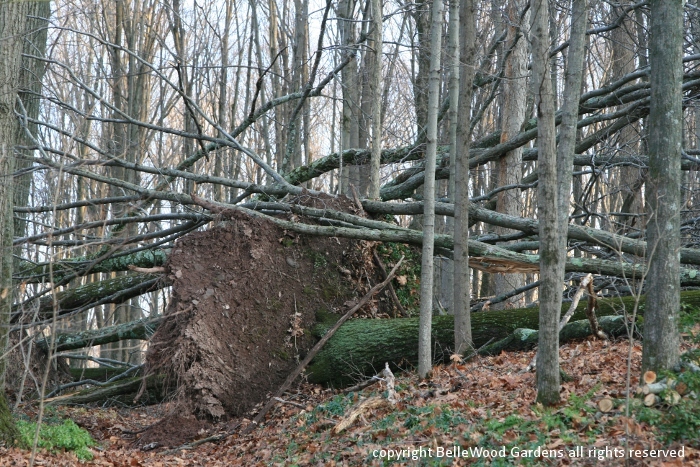 Superstorm Sandy toppled about 20 mature oak trees. We have so much wood. 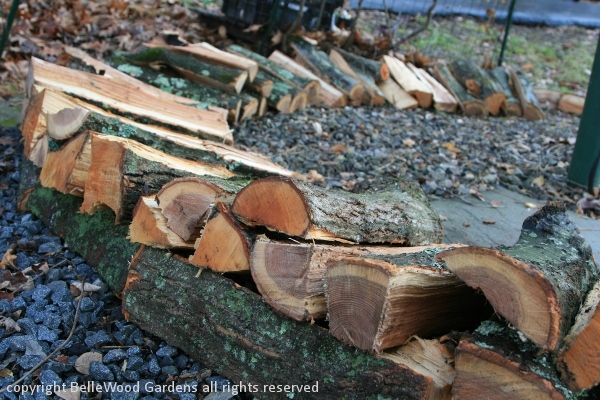 More than can be dealt with this season but even what can be managed is a lot of firewood. It goes something like this: First trim off brush. Then cut to stove length. Next the pieces too big to burn as is must be split. Then all of it - rounds and splits - have to be stacked. 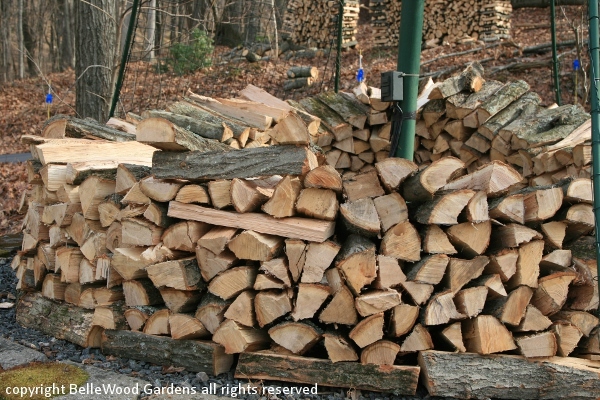 The traditional measurement for firewood is a cord, 128 cubic feet of tightly stacked wood, in a pile 8 feet long by 4 feet wide by 4 feet high. Since our wood stove takes 18 inch lengths of firewood that's awkward. But we're not selling firewood, just trying to stack it neatly so it has a chance to season. The traditional way that we're most familiar with is a linear pile, cross stacked at the ends for stability. That takes a lot of space, and needs to be tarped over the top to protect the wood from wet weather. 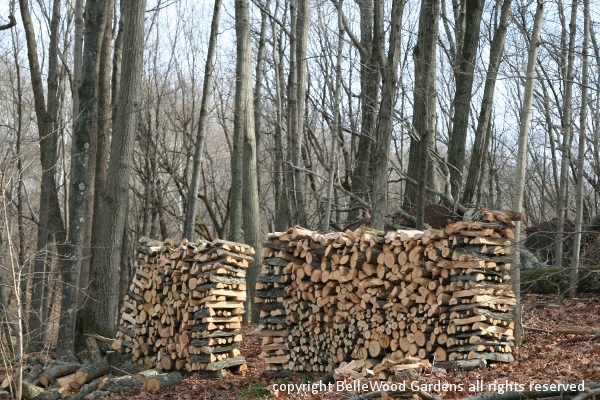 Plus the woodpile should be built on some cross rails so the lowest course doesn't touch the ground. it is right next to the driveway and the gravel layer means it is a well drained site.Wouldn't hold much but whatever it could take would be helpful. And then my clever husband Googled using something like "stacking wood in a circle" for the search terms. And what came up but holzhaufen. Step One: Make a circle of split firewood.Ours is about 9 feet in diameter. 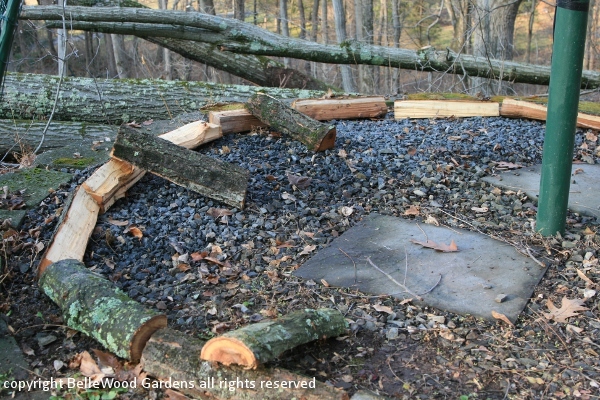 Step Two: Start stacking firewood, radially, so it tips somewhat toward the center. Keep building up. Occasionally use a piece of wood at the perimeter to maintain the slight inward lean. 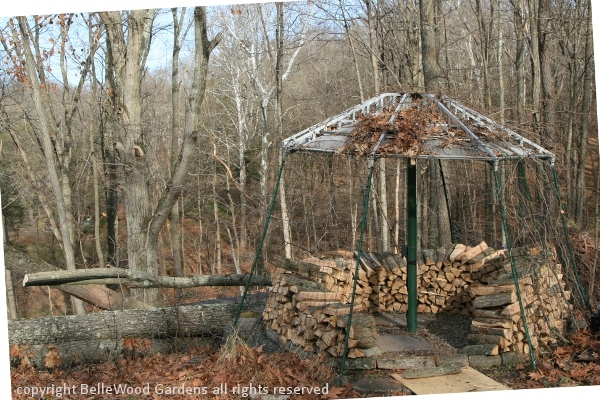 Our holzhaufen is complicated by the three vine trellises on the gazebo, forcing a greater inward taper than otherwise required. It was astonishing how much wood the holzhaufen consumes. Until, that is, you think of your high school geometry class. being the diameter. So 3.14 times 9 feet = 27 feet. Wow! is also being stacked radially. Difficult, as the curve is so tight and firewood doesn't taper. 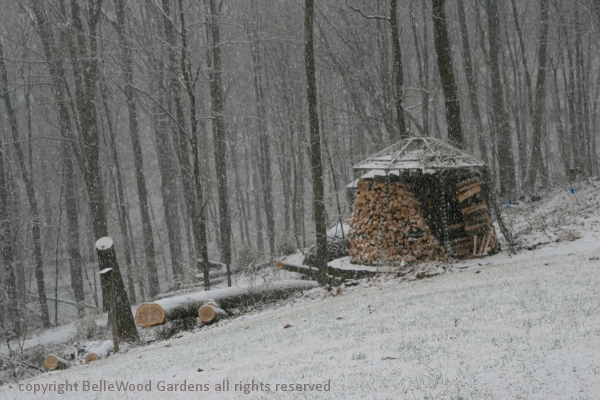 Winter may have put an end to our wood cutting / splitting / stacking. We'll see since it all depends on the weather. 64 cubic feet. And when I complete the holzhaufen, it will store 2 1/2 cords in a compact manner. Here's to circles.